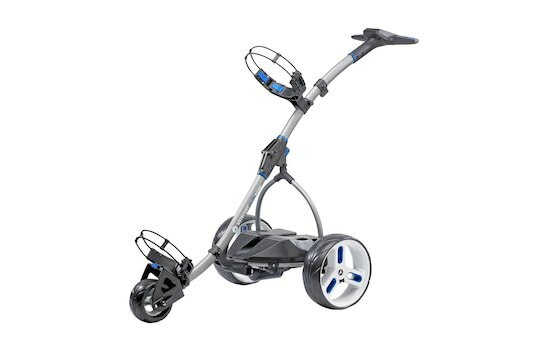 Motocaddy has announced the launch of the brand new Motocaddy S1 PRO trolley – containing all the great features of the award winning S1 Digital, but with some excellent added extras. In addition to an upgraded easy-to-use interface, the new S1 PRO features a 3-step adjustable distance control (up to 45 metres) and a patented USB charging port, perfect for keeping your GPS unit charged and ready to go. The easy-fold mechanism, universal battery tray and adjustable bag supports make it highly versatile, while the eye-catching handle and quick release wheels make this an excellent step up from the entry level S1 Digital. The new S1 PRO range is available in black, titanium and alpine finishes with prices starting at only AUD$899. Building on the success of the multi-award winning S3 Digital, the new S3 PRO trolley features a brand new ergonomic handle, sporty wheels and sleek battery tray. The S3 PRO retains all the features that made the S3 Digital so popular including three distance measurements (drive, round and life), adjustable distance control (up to 60 metres), CartLock security pin code, easy fold mechanism and patented USB charging port – perfect for keeping your GPS unit charged and ready for action. The S3 PRO can also boast new ’round’ and ‘lost ball’ timers as well as an easy to use interface and full colour screen. The new S3 PRO range is available in black, titanium and alpine finishes with prices starting at only AUD$999. Visit www.motocaddy.com.au for more information. Nike Golf Wants to Know: What’s Your RZN?